The CSB review of the Santa Ana Star sportsbook is a bit more unique than almost any of our other reviews. This is because this casino is not only the first to offer sports betting in New Mexico but also the *only* location to offer sports betting in NM. Sports betting has only been offered at Santa Ana Star since late 2018, and there does not appear to be any near term plans for other nearby casinos to begin offering a sportsbook, meaning it will be the only game in town (and the state) for the foreseeable future. Sana Ana Star is a tribal property that is located near Albuquerque. Technically the address of the casino is listed as Bernalillo, New Mexico, but most would cite the area as Albuquerque. The casino features a Las Vegas-style setup, with the majority of the gaming floor being comprised of slot and video poker machines. The sportsbook and even the table games are more of an after thought than they are the main attraction at Santa Ana Star. The sportsbook at Santa Ana Star is located in what is effectively the center of the casino as a whole. We do not know what was in this area before, but it was certainly squeezed in after the change in sports betting laws around the country. The sportsbook is quite small, with the area being around the same size as the typical keno section would be in other large casinos. 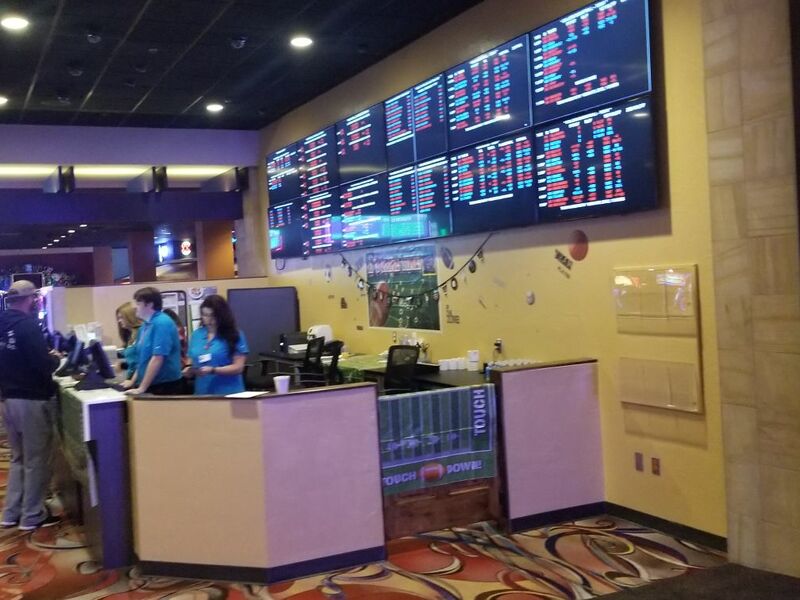 One interesting note about the sportsbook at Santa Ana Star is that they promote the usage of self-betting kiosks more than you would see in most other parts of the country. With that said, since it is a trend in the industry itself, they are likely a step ahead in regards to this betting option. 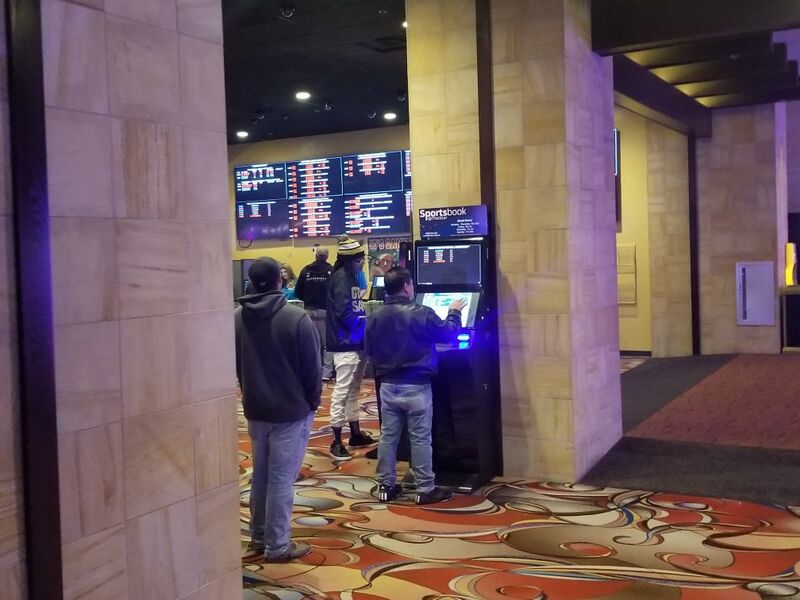 The lines can grow long, however, and the betting maxes at the kiosks will likely vary from those available when placing a bet at the counter itself. The sportsbook had fairly heavy traffic on primary gamedays, like NFL Sunday. We noticed that the book was, for all intents and purposes, “dead” at other times of the day. The book does close in the evening at varied hours, but usually around 9-10pm, depending on the events taking place and the day of the week. We recommend you check to see the hours of operation before you visit if you will be there in the late evening. There is essentially no true viewing area at the sportsbook whatsoever. You will find a counter with cashiers/ticket makers and a few large TVs with all of the lines posted, but there are not games being displayed in the background like you would find at almost every sportsbook in Las Vegas. We would not recommend that you plan to actually watch games at Santa Ana Star, since not only does the book not have seating, but they don’t show games whatsoever. This is prone to change, and we would anticipate improvement in this area in the future, since many bettors want to be able to sweat the games at the same place where as they wager. We have included this section in this particular review because the betting limits and associated rules are quite different than sportsbooks virtually anywhere else. The likely reason for these relatively low maxes is found in the fact that the book outsources its management to a third party company from Las Vegas. The following sheet is accurate as of early 2019, though as always, we suggest ensuring their accuracy if it will play a role in your potential bets. The varied bet maxes are also in place, presumably, to help reduce risk and to formulate proper bookmaking in New Mexico, and particularly at Santa Ana Star, which is in its first years of operation. While the maximum wagers allowed on sports bets are, as of now, fairly low, we would expect these figures to change frequently over time as the industry grows in the state. Another noteworthy mention is the fact that Santa Ana Star’s sportsbook does not accept wagers on games that involve the large colleges in New Mexico, including University of New Mexico and New Mexico State events. This, like most facets of the book, is very prone to change. There are no drinks that are comped or even available at all in the sportsbook at Santa Ana Star. This is due to regulations that the tribal casinos in New Mexico adhere to in uniformity. In NM, alcohol can be served at the bars and restaurants but it must also be consumed only in those areas as well. You cannot order a drink, or bring in an outside alcoholic beverage, and consume it on the gaming floor or the sportsbook. If you try this, the odds are that you will be spotted and forced to throw out your drink immediately. New Mexico is very strict about this rule in their casinos and the sportsbook is no exception. The casino and gaming floor is much more of a destination for lower limit slot players than it is for just about anyone else. Yes, there are table games that are offered, but the volume, rules and limits alike are nothing to write home about. There is a separate high limit room located near the player rewards desk and it is fairly small, even though it includes both a handful of table games and slot/video poker machines in tandem. The rules for blackjack at this casino are not very favorable but instead average at best. The one positive to playing at a New Mexico casino, as opposed to CA or OK casinos, is that you do not have to pay a fee at the table games. The downside is the fairly lax amount of regulation overseeing player payback, meaning players do not receive much in the way of protection from gaming regulators, and in turn receive mediocre bang for their buck. There are a handful of dining options at Santa Ana Star Casino and Hotel. As of 2019, there is a steakhouse, a Mexican restaurant, a sports bar/restaurant and a few other small bars. As noted earlier, if you order alcohol, it must be consumed within these bars and restaurants and cannot be taken onto the gaming floor itself. The food quality and prices alike are very reasonable. We made brief stops at all of the bars and restaurants and always felt like we received a fair deal. Alcoholic drinks cannot be comped at Santa Ana Star, but if you talk to the players club and/or a casino host, you may be able to receive a food comp, provided you play casino games as well. The hotel is not terribly large, sitting at just over 200 total rooms. With that said, it is very clean and modern, having been added to the casino many years after it was originally opened. The room rates are reasonable and it seemed to be fairly easy to attain a comped room. As is the case with food/dining comps, a free or discounted room would be the product of your casino play, and your sports betting is unlikely to earn much if any goodwill towards a free hotel room at Santa Ana Star. As of 2019, there is no mobile or online sports betting option via Santa Ana Star’s sportsbook. Based on research and discussion with sportsbook employees, it does not appear that the launch of a mobile device is imminent. As a whole, the bottom line when it comes to sports betting at Santa Ana Star is convenience. If you live in the area and do not want to use an offshore sportsbook or a bookie, you now have the option to physically go to the casino and place a wager. The problem with Santa Ana Star is that it is not a great destination for actually *viewing* games, and the maximum bet sizes, when compared to larger properties or online sportsbooks, is quite low. If you are a local, or you are stopping by and want to make a few smaller wagers, we would say that Santa Ana Star is worth betting at. We would not, however, say that there is anything that sets it apart from the competition, and that its current status as the “only game in town” is its primary asset.